The long-awaited report on how Portland Harbor's toxic pollutants could be removed or entombed is now in the hands of federal bureaucrats, who will take up to two years to decide on the best approach. Now they need to hear from Portland. 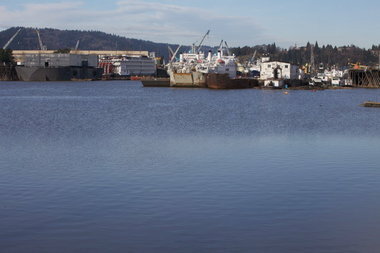 The 11-mile-long Superfund site, where the Willamette River bottom is loaded with PCBs and other chemicals from decades of manufacturing, was declared in need of cleanup more than a decade ago. Since then, competing public narratives about health risks of the pollutants and the scale of the cleanup have clouded, if not toxified, most debate on the subject. It's finally time to start cutting through the muck. It is a fiction that harbor companies -- more than 130 past and present could be on the hook -- will do anything to avoid paying a dime beyond bare minimum cleanup costs, now pegged at $169 million, and threaten to kill harbor jobs if they don't get their way. It is equally a fiction that environment advocates believe the only effective cleanup means industries, along with the City of Portland and the Port of Portland, must pay nearly $2 billion to dig up and remove all pollutants over the course of 28 years -- and that anything less means excessive health risks and a betrayal of the community. We'll surely do neither. A combination of dredging up some sediments and burying others in place will likely be the chosen course. But it will be expensive, take a lot of time -- and compete with Big Pipe as Portland's least-seen big-ticket infrastructure improvement. Cutting Through the Muck <-- Full Opinion at original site.